When should I come to Drake Bay? At GringoCurt.com, this is one of our favorite questions. And the answer is more nuanced than you might think. You have probably read in various travel guides, that you should come to Costa Rica in dry season (December to March) and avoid it altogether in the wettest months of September and October. But depending on your specific interests, this might not be true at all. So, let’s break down the seasons of Costa Rica in more detail and let you decide when your vacation should be- instead of letting Lonely Planet do it for you. If you are avid bird watchers like us, you might find the “low” season a more interesting time of year. In May and June for example, we see many species of birds after they have finished breeding, so the chances of seeing juveniles and family groups is much higher. Want to see a baby Heron or Aricari? May and June might by the months for you. If Migratory birds are your thing, July-October is your best bet. We are visited by many different species of warblers, tanagers and orioles during these months. Between Novemeber and February is the best time for those who really need to cross Tucans off their list. In the Osa Peninsula the Black-mandible Toucan can be found in many gardens and forest edges during this time of year, as they forage and pair up for breeding season. Not too Many People Please! If you are the type of traveler that loves to go where the action is not- try May in Drake Bay. The Osa Peninsula is by far the least touristy of Costa Rican destinations. But May has the advantage of being the second lowest month (after October), without the increased chance of tropical storms. Just do us one favor- don’t ask the locals for discounts- the only thing that gets lower in low season is the amount of tourists, not the price of eggs. 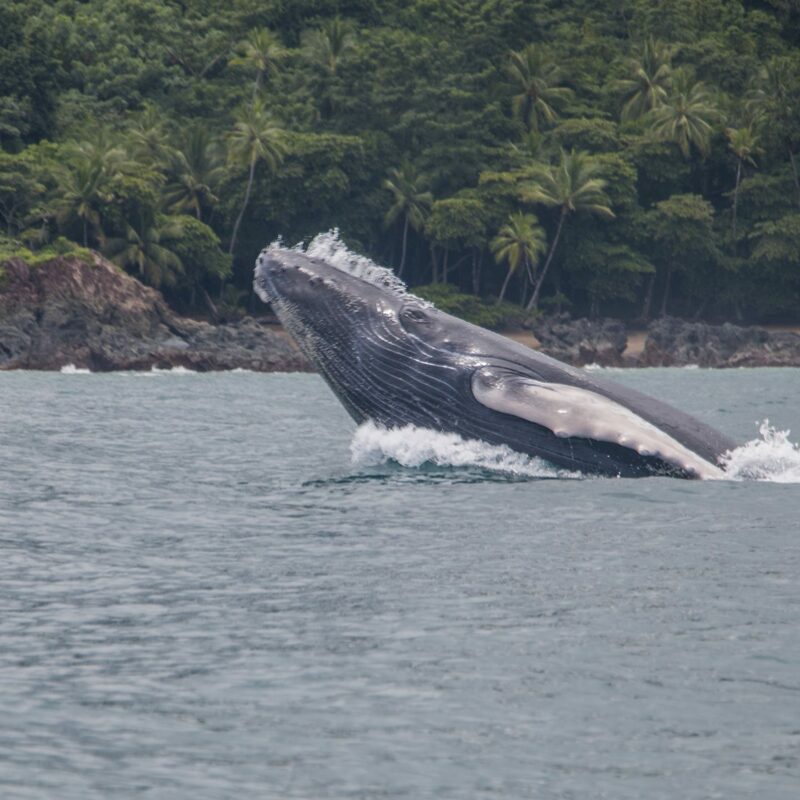 Drake Bay is by far the best place in Costa Rica to encounter marine mammals. What people are mostly asking when they ask about Whale Season in Drake Bay, is Humpbacks. In reality, there are only 2 months out of the year when it is unlikely to find Humpbacks in the bay, May 15 to July 15. At all other times of year you can encounter breeding pairs and babies. The peak of the year is September to November, when the largest family of Humpback Whales on earth is the most active. As for other types of marine mammals, Drake Bay has 25 species of resident or visiting whales and dolphins. 3 of which can be found in MegaPods, all year round. On Whale and Dolphin Adventures we have personally encountered- Bottlenose, Central American Spinners, Pantropical Spotted Dolphins, False Killer Whales, Short-finned Pilot Whales, Orcas, Short-beaked Common Dolphins, Rough-toothed dolphins, and Sei Whales… and many more. Take a look at some of our videos for inspiration. Drake Bay is home to some of the best world-class fishing in Costa Rica. Between the months of November and March, you will have an excellent chance of reeling in species such as Blue Marlin, Black Marlin, Sailfish, Dorado (Mahi Mahi) and Wahoo. Many different species of Snapper and also Roosterfish are there for the taking all year apart from September and October. For Yellowfin Tuna, the best months are June-August and also December and January. Overall, we would recommend avoiding fishing in Drake Bay from September 15 to October 15, as there is a high chance of tropical storms, making the water close to shore very murky, and offshore fishing charters somewhat bumpy! Take a look at this excellent guide by Costa Rican Vacations for more information. Costa Rica is famous for sea turtle conservation. In the Osa Peninsula alone, there are upwards of 6 sea turtle projects, on some of the most pristine beaches in the country. If you are interested in volunteering for this worthy cause, or taking a sea turtle tour, the best months to visit are from August to November. During these months it is possible to see both nesting mothers and turtle hatchlings. Of the 7 species of sea turtle worldwide, the Osa Peninsula is visited by Olive Ridley, Green Turtles, Hawkbills and even the occasional Leatherback. Cano Island snorkeling or diving tours, and whale and dolphin pelagic tours are also an excellent opportunity to encounter turtles. We have even seen Olive Ridleys and Green Turtles mating! As you can probably figure out by now, there are very few times of year we would not recommend for your vacation in Costa Rica. The exception? March. The driest, hottest, dustiest month in Drake Bay. If you come to Drake Bay in March, make sure you choose a hotel that is located away from the road and/or has a nice sea breeze. To book your trip to Drake Bay, take a look at our adventure packages page for custom itineraries and our local travel agent services.